Santa Cruz de Tenerife is the capital of Tenerife. It is on the north-east coast of the island. 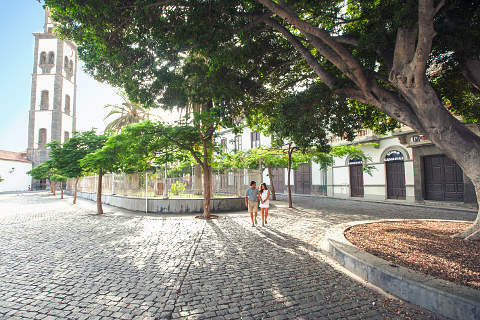 Santa Cruz de Tenerife was named one of the best five places to live in the world by 'The Guardian' newpaper in 2012. 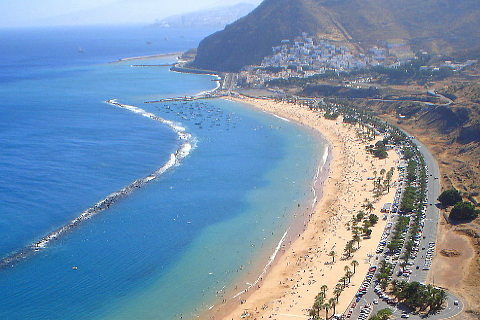 Santa Cruz de Tenerife is the island's capital and shared capital of the Canary Island. Its deep natural harbour has historically led to a period of wealth and many fine historic buildings can be seen in the city. Even today the harbour is one of the busiest in Spain and is also an important harbour for the cruise ships which visit Tenerife from around the world. Santa Cruz's main beach is 'Las Teresitas' which is a fine golden beach courtesy of millions of tonnes of sand from the Sahara desert. With palm trees and a back-drop of the Anaga mountains it is consisdered the most beautiful beach on Tenerife. In the town itself head for Plaza de Espana near the harbour. Between here and Plaza de Candelaria is an excellent shopping area and Calle de Castillo is the main shopping street. If you are looking for some lively nightlife then head down to Avenida Anaga on the waterfront. The Plaza de Espana is the heart of Santa Cruz de Tenerife and is the biggest Plaza on the Canary Islands. 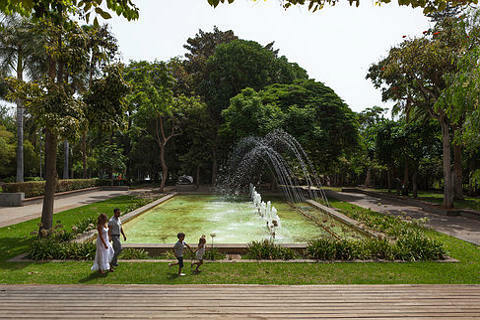 The square has a large artificial lake and is very attractive and a great place to pass some time. Nearby is the Port of Santa Cruz de Tenerife which is home to the Auditorio, the most iconic building of Tenerife. The Auditorio de Tenerife is Tenerife's modern auditorium designed by Santiago Calatrava and has a style reminiscent of the Sydney Opera House. Its distinctive shape has been designed to look like the sails of a yacht. It is now one of Tenerife's most famous buildings. Also by the port is one of Tenerife's water parks, the Parque Maritimo Cesar Manrique. This is an area of about 22000 square meters of saltwater pools and associated facilities designed by Canaries architect Cezar Manrique. Next to this is the Palmetum of Tenerife which is a large botanical garden and contains one of the biggest collections of palm trees in the world. From here you also get some lovely views of the sea. There is also another excellent park in Santa Cruz, the Parque Garcia Sanabria with gardens and fountains and it is a pleasant place to relax. One of Santa Cruz de Tenerife's main monuments is the Iglesia de Nuestra Senora de la Concepcion, a church which dates back to the 16th century and was one of the first churches to be built on Tenerife. It is sometimes referred to as the Cathedral of Santa Cruz but it is not a cathedral. The only cathedral on Tenerife is the Cathedral of La Laguna. The Iglesia de San Fransisco contains a number of artworks and is considered to be the best example of Baroque architecture in the Canary Islands. Also worth visiting is the Mercado de Nuestra Senora de Africa which is a lively bazaar and food market and worth heading for in the mornings. If you're not sure when to visit Santa Cruz then consider carnival time in February. The Carnival of Santa Cruz is the biggest in Spain and the second biggest in the world after that of Rio de Janiero. The carnival is such a popular and important one that it is being considered for UNESCO World Heritage status. It is already a 'Fiesta of International Tourist Interest'. The Museo de la Naturaleza y el Hombre contains the cannon which shot off the arm of Admiral Nelson! The museum houses collections of archeology and biology and is famous for its Guanche mummies. San Cristobal de La Laguna, often called La Laguna is a UNESCO World Heritage Site and is considered to be the cultural capital of Tenerife. Do not miss a visit to the beautiful Parque Rural de Anaga with its beautiful mountain scenery and ancient Laural forests. This covers the north-eastern tip of Tenerife just next to Santa Cruz and is stunning.